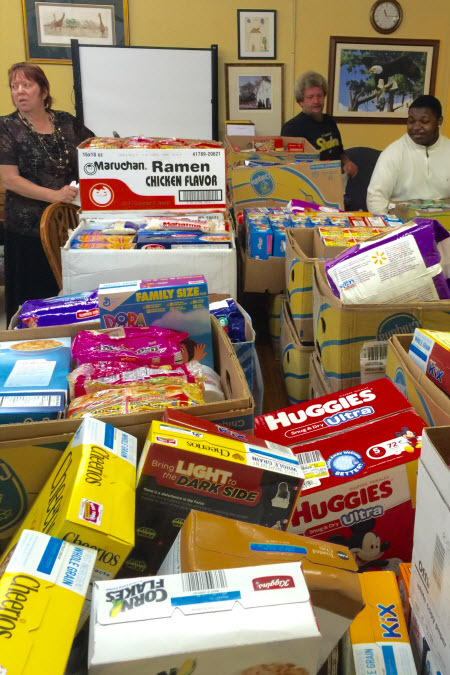 Food Donation — The Women's Resource Center of Florida, Inc. RESULTS COMPANY'S FOOD DRIVE BENEFITS WOMEN'S RESOURCE CENTER OF FL, INC.
Winter Haven, FL, April 4, 2016– The Results Company, a local business has just donated 1,663 food items to stock the Women’s Resource Center’s free food pantry serving low income clients. The Results Company is an inbound/outbound contact center currently employing over 450 people. The company held a food drive to benefit the Women’s Resource Center aptly named “Hang Up On Hunger.” Karen Upshaw’s Team (Photo 1) effort culminated in over 1,000 items! Thank you one thousand times over from and staff and clients of the WRC. Andew Lineberger and Cherie Simmers are photographed with the generous food donation (Photo 2). The Results Company promises to make “Hang Up On Hunger” an annual event. The Results Company actively works with the Chamber of Commerce and other local charities to help make the Winter Haven community a better place to live. According to WRC Executive Director, Cherie Simmers, this donation will provide over 200 food bags to be distributed to WRC’s low-income clients. When food stamps run out or clients are waiting for paychecks they come to WRC for staples such as beans, rice, peanut butter, cereal, mac & cheese and other canned food items. Founded in 1984, the Women’s Resource Center of Florida Inc. maintains offices in Winter Haven and Lakeland, providing a variety of social services including education, mentoring and job coaching programs. In addition, the WRC maintains a thrift store, The Cheep Boutique, which aids in the agency’s program funding.